In part two of this 4-part series about year-round strength training for triathletes, we’ll cover the second phase of the yearly program. In part one, we introduced the first phase, the off-season Stabilization Phase, which starts 10 days after the last race and lasts 3-5 weeks. Once we have established a sound platform of movement through adherence to a stabilization-oriented block of strength training we can begin to progress the athlete by introducing some external loads and more demanding exercises. I chose to organize the second phase of training as a Muscular Endurance (ME) phase. This is an intermediate phase designed as a logical progression to bridge the gap between the first Stabilization phase and the upcoming Maximal Strength/Reactive phase, ultimately leading the athlete towards an “in-season” Maintenance phase. A safe and effective time range for this block of ME training should be 3-6 weeks depending on how the athlete is adapting and tolerating the loads. Increasing the total volume of work which increases cellular mitochondrial density thereby improving economy and work capacity. Mitochondria are the only sub cellular bodies that break down carbohydrates, fats and proteins to produce energy for exercise. Thus the greater the amount of mitochondria, the greater our ability to perform work. Improved rate of force development (RFD) by introducing low-level reactive training loads; this makes an athlete more effective in the water, on the bike and when running because they are able to produce more force at a higher rate of speed. Further promote stability and range of motion at the joints, and tissues which affect the joints, thereby decreasing the incidence of force leaks or power leaks which occur as a result of inappropriate laxity at the joints. Just what is a force leak? One example is laxity at the foot and ankle complex during the initial contact phase of the run, producing excessive pronation at the medial malleolus–or in other words, the inner “ankle” bone collapsing towards the ground. This softness in the foot and ankle typically continues up the kinetic chain, causing internal rotation of the knee in space and out of alignment, which tends to destabilize the hip and low back. All of this distortion can be mitigated through the application of a sound strength training program. Several studies have demonstrated that strength training with concurrent aerobic endurance training has improved economy of movement and increased time to exhaustion in well-trained endurance athletes. In one study, Jan Hoff and colleagues found that running economy improved by 5% and time to exhaustion at maximal aerobic speed was improved by 21% among participants who engaged in an 8-week strength training program in conjunction with their endurance training. Similarly, Paavolainen et al. (1999), found that nine weeks of plyometric or explosive strength training reduced 5k running times by 3% and improved running economy by 8.1% in well trained endurance athletes. Other studies have shown similar findings with swimmers and cyclists where the control group maintained endurance training without strength training, while the intervention groups added strength training to their endurance regimen. Many of these studies utilize heavy weight or plyometric protocols, which would be irresponsible to outline here without first laying the groundwork like we have done with this and the last phase, preparing the body for more demanding loads. For our purposes the ME phase will be characterized by incorporating external loads and trying to enhance proprioception with a more challenging exercise selection (proprioception is the ability for the body to sense, manipulate or maintain position and movement in space). We will also introduce some simple reactive/plyometric patterns to prepare the body for more intensive loads in the future as we trend towards more explosive movements. This phase will involve “super-sets” (coupling two similar exercises: one strength and one stabilization) designed to increase motor unit recruitment and enhance joint stability. The loads should be between 60-80% of maximal load. We will define maximal load as the most significant load you can safely perform for two repetitions of a given exercise. Let the repetition scheme dictate the selection of loads. In other words, if you cannot perform the desired amount of repetitions for the exercise then then there is too much load. This is an easier approach than trying to calculate percentages of maximal load. Never force range of motion beyond what the tissue and joints will currently allow. If you are unable to achieve the ranges in the video; modify the movement, reduce the load or contact me for an alternate exercise. Always try and maintain structural alignment of hip, knee and ankle. Wherever possible draw in the navel by actively contracting it towards the spine (this should not affect respiration). Wherever possible activate the levator ani by pretending you have to go to the bathroom, but cannot. This activates the pelvic floor and promotes stability of the hip complex (similar to a Kegel exercise). Always think about even distribution of ranges of motion and tension/load per limb and per hemisphere. We must always work towards even distribution of forces or tension-reducing asymmetry. Here’s a strength workout for the ME Phase, targeted towards endurance athletes. I’ve also included a playlist of instructional videos for the exercises. The athlete should do this strength routine 2-3 times per week with two days of recovery between. It’s best to avoid putting the strength days on recovery days if possible, as the metabolic load of strength training can be intensive. This is designed to condition low leg and the series elastic component (SEC). SEC is comprised of muscle and soft tissue which when stretched/lenghened acts like a “spring” storing potential energy. When followed by a concentric action (contraction) that potential energy is released as kinetic/movement like a rubber band. If too much time elapses between the loading and unloading that energy will dissipate as heat. This is a low-grade form of reactive/plyometric training. Be sure to get the big toe involved (first ray). Perform 3-4 sets of 30-40 reps. Rest :20 between. I was conflicted about adding a squat because many endurance athletes seem to be almost scared of squatting. In the end, I decided it’s too important to neglect as it appropriately sets the stage for some single-leg patterns in the future and there is no other way to achieve the adaptations squatting provides in terms of structural load. The key is to go light if you are at all unfamiliar or uncertain. 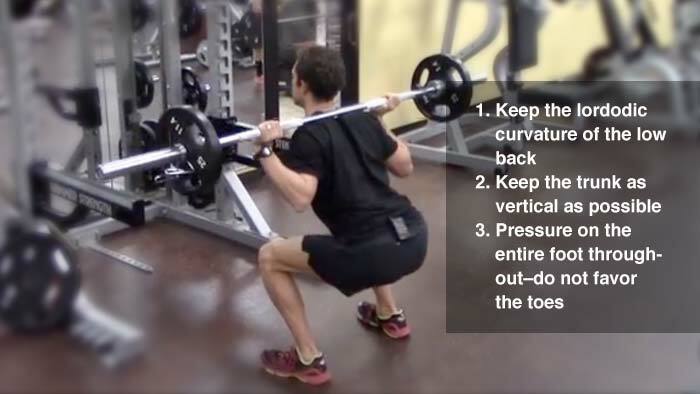 Virtually anyone should be able to perform a squat with directed effort and starting with low or NO LOAD. Do a warm-up set of 12 reps (light/no load) followed by 3 sets of 9-14 reps. Rest :20-:45. If you are uncomfortable with squatting or have sustained, serious low back injuries contact me for a substitute or, perform with dumbbells. Couple this pattern with the back squat above, alternating back and forth between the patterns. Perform 3 sets of 8-12 reps with appropriate load (you can use a dumbbell if you don’t have a cable or band). Rest :20-:45. Stack (super set) this with the up-down plank below. Complete 3-4 sets of 10-12 reps. Rest :20-:45. 3-4 sets of 8-14 per side, alternating the lead arm resting only,:20-:45 before going back to the chest fly. Step 3 sets of 8-12 per with :75-:90 between. This movement is standalone and reactive in nature. Complete 3-4 sets of 10-12 reps with :20-:45 rest and super set/stack with the cherry pickers below. Perform 3-4 sets of 9-12 reps per direction here. 20-:45 rest. Perform 3-4 sets of 14 reps. :20-:45 rest between, superset with the retraction/abduction below. Get through 3 sets of 10-12 with as much range and symmetry as possible. Be sure to activate the glutes, and try to relax the hamstrings. Subscribe to emails from TrainingPeaks to make sure you get parts 3 and 4 in this series. To read part 1, visit “Year-Round Strength Training for Triathletes, Part 1: The Off-Season“.